The new Larvanator ALD-365 is a patent-pending automatic larvicide dispensing device that works year-round to eliminate mosquito larva in catch basins, french drains, culverts, drainage systems and other places that hold standing water. 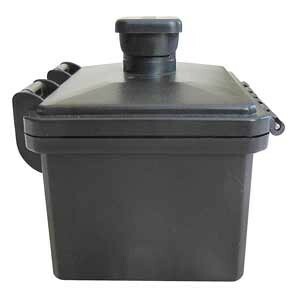 It fastens quickly to the underside of any catch basin cover, and automatically dispenses a professional grade insect growth regulator (IGR) into the catch basin every 30 days once activated. It runs on one 9-volt battery, which is replaced annually. The constant presence of larvicide kills mosquito larvae, preventing them from becoming adult mosquitoes. Watch an online video of the product in action at https://youtu.be/M1la281ihUs.